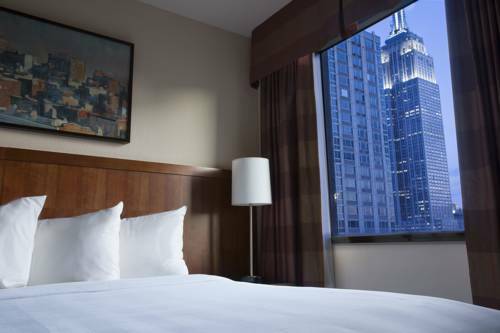 Residence Inn New York Manhattan/Times Square boasts an exceptional location in the heart of the Big Apple. Experience the serenity of NYC when going for a stroll in nearby Bryant Park, or catch a live show on Broadway, both within easy reach. When it's time to get some shut-eye in the city that never sleeps, unwind in our studio, 1- and 2-bedroom suites with pillow top mattresses and modern amenities including free Wi-Fi and fully equipped kitchens. Join us in the morning for a free breakfast buffet featuring an array of healthy and hearty options. Bryant Park Lounge, our third-floor bar, is the perfect place to get your evening started or grab a nightcap before bed. Keep up with your workout routine even when traveling in our fitness center featuring cardio equipment and free weights. Our hotel offers 7 well-appointed event rooms ideal for social events and professional meetings. Perfect a quick trip or extended stay when booking your getaway at Residence Inn New York Manhattan/Times Square. Our full service bar and restaurant boasts a menu filled with traditional entr es and signature beverages designed to excite taste buds. Enjoy a refreshing drink accompanied by live music and picturesque views of New York City. - Ha! Comedy Club N.Y.C.